4-Word Review: Werewolves can be cool. Scott (Michael J. Fox) is a frustrated teen who plays for a losing high school basketball team and longs for a hot girl (Lorie Griffin) that barely knows he even exists. He is tired of being ‘average’ and wishes he could somehow stand-out. Then one day he finds out that he can turn into werewolf, which was something that he inherited from his father (Paul Hampton). Now suddenly Scott finds himself standing out from the crowd and receiving lots of attention, but sometimes getting what you want isn’t always the answer. Fox has noted in subsequent interviews that he thinks very little of this movie and seems embarrassed by it. He even refused to appear in its sequel, but the truth is he is the one reason that keeps it watchable and I consider it his most engaging performance and the make-up effects aren’t bad either. The problems that I had are more with the character that he plays as he comes off at times as being quite selfish and shallow. He hangs out with an attractive girl named Boof (Susan Ursitti)(how a young lady could ever acquire such a strange and horrible name like that is a mystery and should’ve been elaborated on, but that’s a whole other issue.) Anyways she is clearly in to him and the two get along well, but instead he chases after Pamela who doesn’t like him. Having him talk about his longings for Pamela in front of Boof, which upsets her and Scott doesn’t notice this even though anyone else would, makes Scott seem aloof and self-centered let alone stupid for going after someone he has no chance of winning over. In films if the viewer doesn’t like the protagonist then it is hard to get into the rest of the movie and if it weren’t for Fox’s great performance this guy would be a real dud. He also gets involved in a reckless activity of driving a van down a street while his friend (Jerry Levine) stands on top of it and pretends to be surfing, which is insane because all it would take is one sudden stop and that friend flies off the vehicle and gets a broken neck. Protagonists in films aimed at impressionable audiences like this should not be doing stunts that young viewers might go home and try to emulate. Fortunately as far as I know none of them did, but it’s still not a good precedent to set. I was also confused about what the rules were in regards to the whole werewolf thing. I thought the folklore was that people could only turn into werewolves during a full moon and not just whenever they wanted to like here. Why does it take so long, like not until Scott turns 17, before he finds out that he has inherited this condition? Also, it seems hard to believe that his father would be able to hide his werewolf ability from his family for so long. You’d think that by living with his father all of his life that Scott might’ve had a hint of his Dad’s werewolf trait long before the old man finally decided to come out with it. On top of all that, where exactly does all this hair go when Scott transforms back into a human. The film shows a strand here and there, but there would be more like mounds and mounds of it. How does Scott go back and forth from a human to a werewolf? Does he just say to himself ‘I want to be a werewolf’ and then he is and what does he say or do to turn back into a regular teen? Besides those issues there is also the fact that Scott becomes very open to everyone about his werewolf side, so why do only people in his high school know about it? If somebody divulges such an amazing ability they would be on the cover of every magazine and newspaper. Scientists would want to examine him and talk shows would be clamoring for interviews, so why doesn’t that happen? Despite all of this I was actually liking the movie most of the way as it has a nice engaging sense of humor. Unfortunately it doesn’t go far enough with the idea. Eventually it gets compressed into the formula of being just another feel-good, teen-life-lesson flick, which is a dispiriting sell-out that ruins its offbeat potential and tarnishes an otherwise interesting concept. 4-Word Review: He has lofty ambitions. Brantley Foster (Michael J. Fox) has just graduated from high school and wants to take a stab at the big city. He has a nice job lined up, but when he gets there he finds that they’ve become victims of a hostile corporate takeover and his position is no longer available. His mother (Elizabeth Franz) tells him about his rich Uncle Howard Prescott (Richard Jordan) who is a CEO of a major firm. 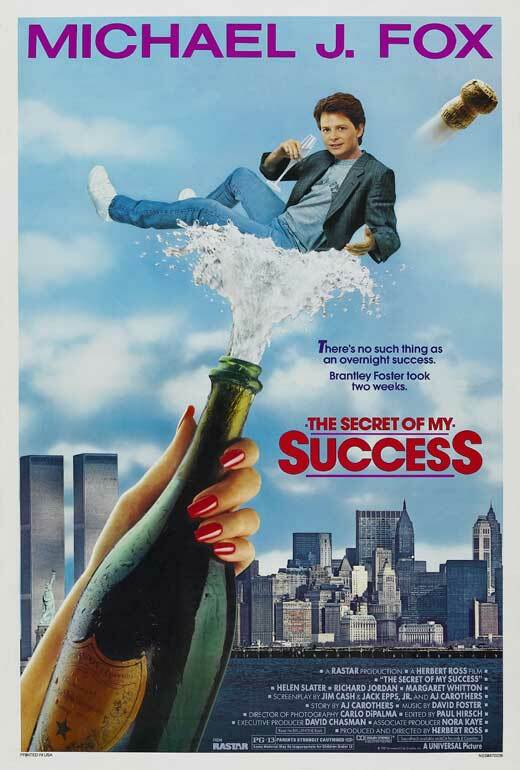 Brantley meets with him and manages to get a job in the mailroom, but then comes up with a scheme where he masquerades as a company executive while romancing an attractive boss (Helen Slater) and even his uncle’s wife (Margaret Whitton). Fox is terrific in the lead and his engaging and likable presence makes up to some degree for the film’s other numerous shortcomings. There are a few funny scenes including the one where Brantley pretends to be an orchestra conductor by using the sound of a couple making love in the next apartment as his ‘music’. The bird’s eye shot of a group of executives jogging around a track that is situated on a roof of a Manhattan skyscraper is fantastic and my favorite moment of the whole film. Brantley’s scheme though is ridiculously over-the-top with no chance of ever successfully occurring in the real world, which makes the story less entertaining since the believability factor gets thrown out to the point that it becomes a completely inane farce by the end. The humor is also too broad and would’ve worked better had it tried instead to be more subtle. A good example of this is where Brantley gives a limo ride to Howard’s wife Vera. Initially Vera is quite cold and bitchy towards him, but then he throws her a line of how he’d feel like ‘the luckiest man in the world if he awoke each morning with a beautiful woman like her lying next to him’, which is enough to ‘melt’ her cold exterior and have her invite him back to her place where she shamelessly comes onto him and even goes skinny dipping with him in her backyard pool. Yet I’d imagine an attractive, rich woman such as herself would get lines like that thrown at her all the time by other men and how would she know that Brantley, whom she had just met, wasn’t any different than the rest of them and simply looking for a way to get her between the sheets or at her money. There is no way a woman of that age and social pedigree would foolishly let down her guard that quickly and easily especially for a line that is rather unimaginative and corny. I realize this is supposed to be a wish-fulfillment fantasy, but it goes overboard and too much of a good thing is never good. The so-called ‘American Dream’ is all about persevering and overcoming hardships and obstacles not like it is here where we have some wet-behind-the-ears kid who magically has all the answers while essentially cheating his way to the top in record time without even breaking a sweat and making everyone else who actually works for a living look like complete fools in the process. A little grit and realism would’ve helped and at least given it some much needed balance, but instead it’s completely lacking, which ultimately makes it shallow, superficial and silly and not worth the time.